You know how it is when you're out vintage shopping or antiquing. As a veteran shopper you may not have a clear mission or agenda when browsing through aisles, displays or tables, because items that you already collect will immediately grab your attention when you come across them. It's almost inevitable for that to happen to us vintage/antique collectors. If I ever come across a vendor who has cookie cutters while shopping at antique malls or flea markets, I make it point to look through the selection just to see if anything seems good enough to take home. 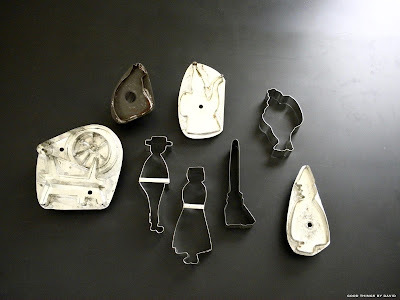 On this particular day, I noticed a zip-top plastic bag chock-full of old tin cookie cutters, so I gave them the once-over and purchased the lot because they seemed to be in good condition, and they were shapes I didn't already own. It wasn't until I closely inspected the individual pieces later in the day that I noticed their significance. A few of them still had their original labels. Horman O. Foose began his tinsmithing business in Fleetwood, Pennsylvania back in the early 1970s. With his wife by his side, Horman offered a selection of tin products which included pierced lanterns, sconces, and, of course, cookie cutters, among other things. To this day, the H.O. Foose Tinsmithing Co. hand makes tin cookie cutters here in the United States for stores, vendors and to sell online through their website. 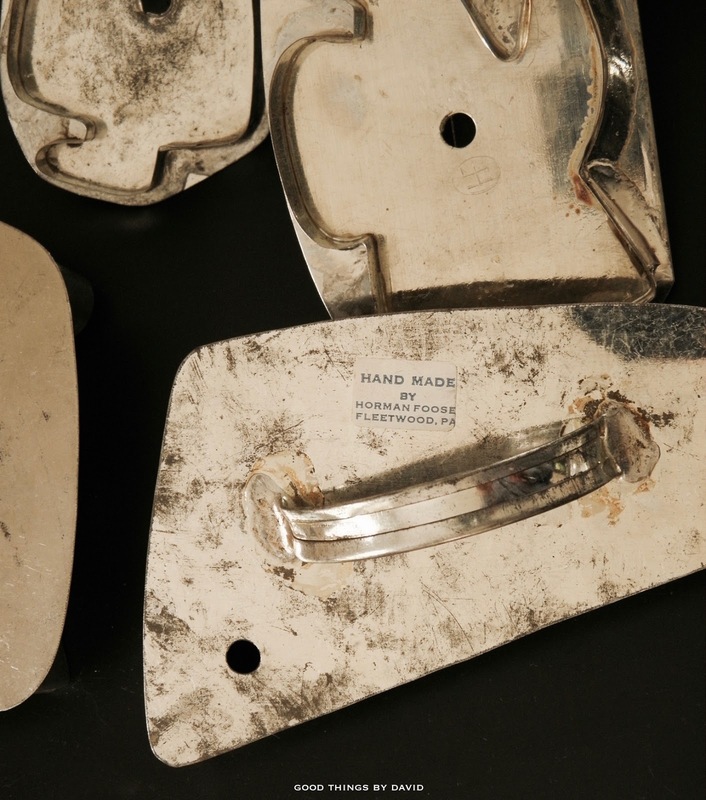 What distinguishes the older tin cookie cutters from their present-day renditions, is the closed-back-with-handle construction (photo above). 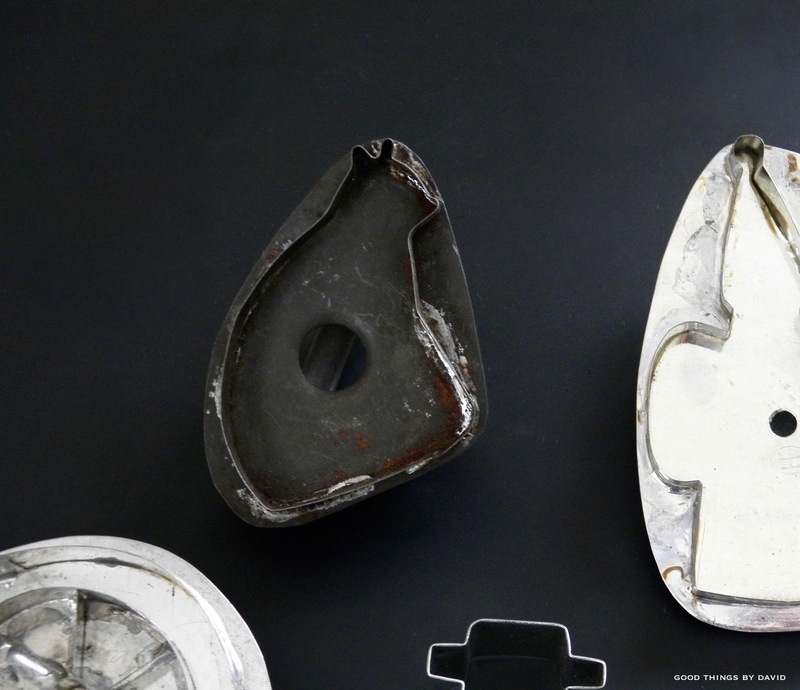 Foose tin cookie cutters these days are without any backs or handles. 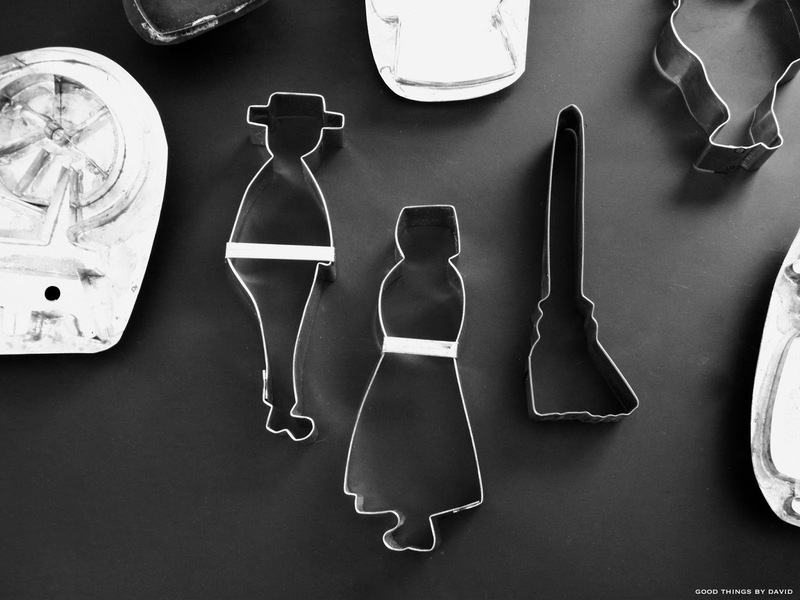 Chances are that you probably own some of their cookie cutters if you happen to bake cookies. 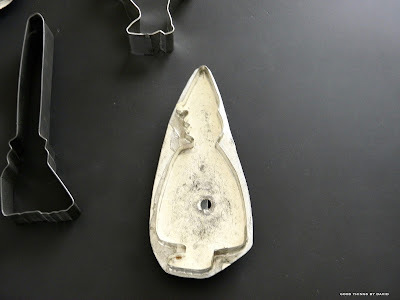 They are affordable, well-made tin cutters that are very versatile. Some of my favorites are their stars and cats. 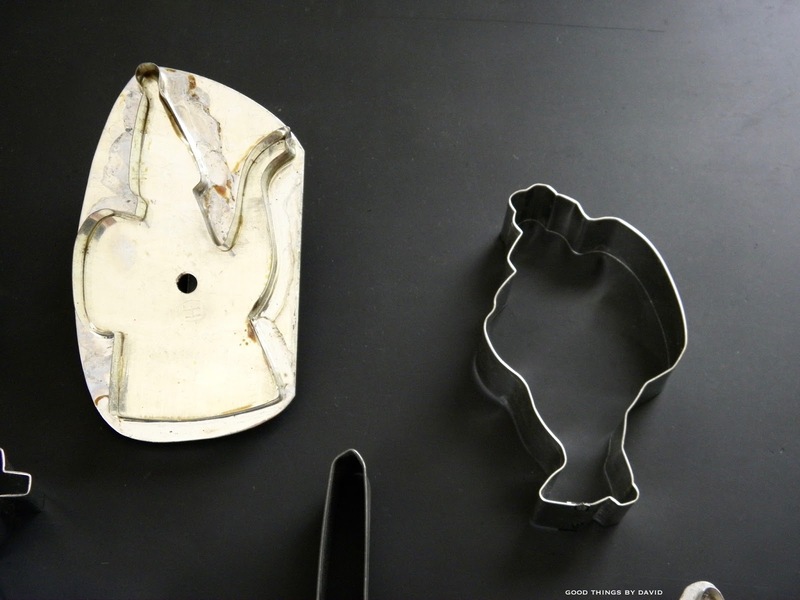 This particular cookie cutter with its pointed head may be a representation of an American firefighter from yesteryear or perhaps it's a vintage silhouette of a British police officer. What's unmistakable about this image is the pointed hat and the large coat. The cookie cutter to the left appears to be in the shape of an antique coffeepot (silver or pewter coffeepot?) and on the right, the jolly outline of Santa Claus holding his sack of presents is ready to cut out cookies for Christmas. I love these two shapes! I can't make out what kind of animal this dark cookie cutter could be. Perhaps it's a bear or a squirrel taking a rest, but it can also be a cat or even a cow sitting down on the field after a hard day's work. Who knows? Look at these three cookie cutters in the center. I see either a Quaker or Amish Pennsylvania man and woman, and a corn broom. I think I could make Quaker and Amish cookies using these cookie cutters with great success, but I would have to make the distinctions between these faiths by showing the differences in attire. This is by far my favorite of the bunch. A large spinning wheel used in the olden days for weaving is very unusual for a cookie cutter. 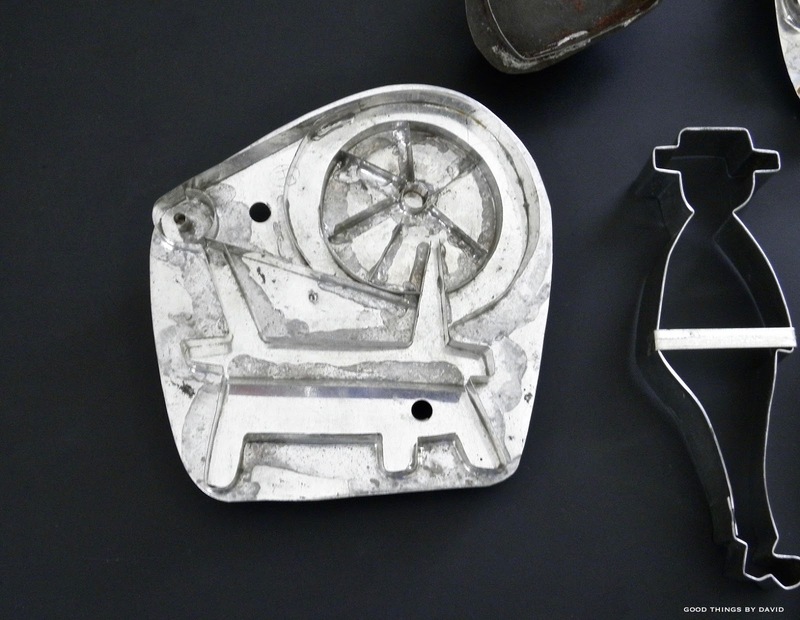 I don't think I've ever seen a cookie cutter like this, and from my online searches, I have come up blank with images of such an example. Well, I think this cookie cutter is a small piece of artwork in my opinion. You can clearly see the legs, the horizontal table and the large spinning wheel (also known as a bobbin winder). 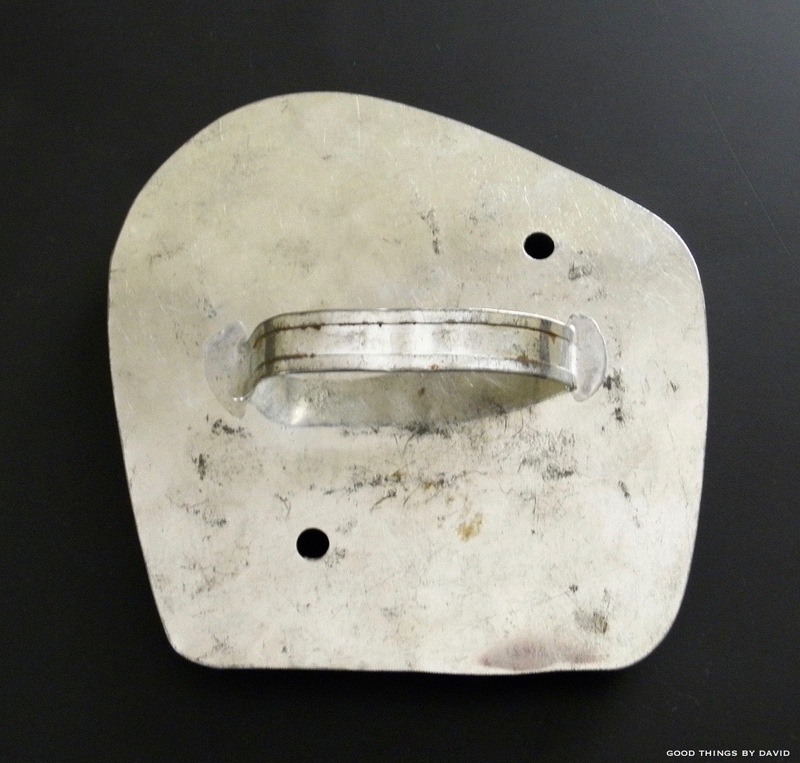 This is the closed back and handle of the spinning wheel cookie cutter. I can't wait to use it in the near future. 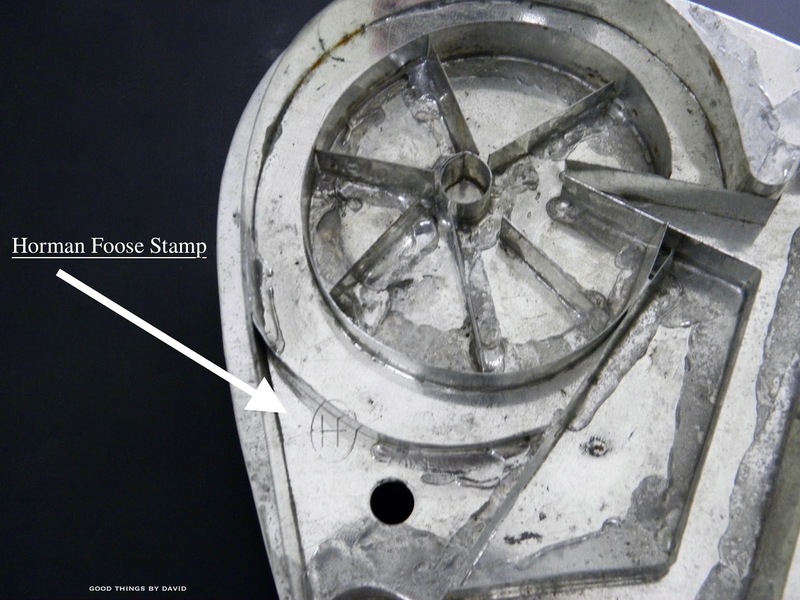 The older Foose cookie cutters have a stamp with the monogram of Horman Foose. In the photo above, the 'HF' was stamped onto the cutter side of the flat back. Here is another version of that classic stamp. 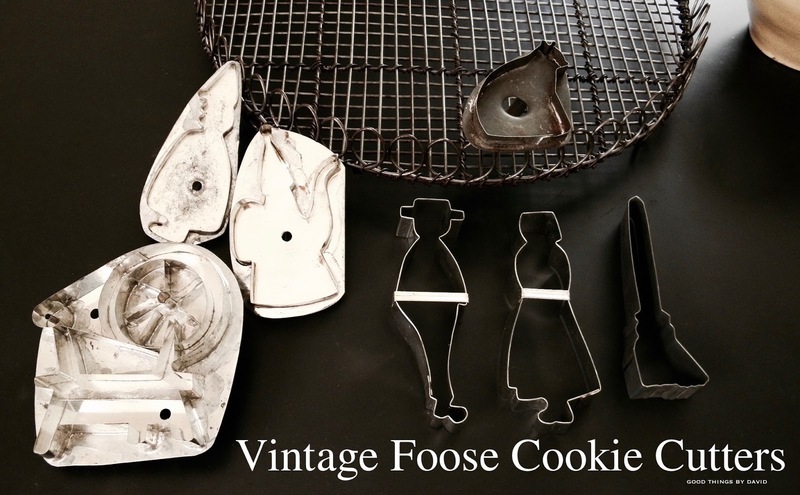 Now it's your turn to search for some Foose cookie cutter treasures online or at antique markets! If you find yourself in the vicinity of an antique mall, antique shop, secondhand store or even a flea market, don't overlook those stalls or vendors with cookie cutters. Often times you may find that the best of the bunch are those that have been grouped together in baggies or jars. This just goes to prove my point that you never know what you're going to find. Another person's junk may in fact be some piece of treasure for you. Keep an open mind when shopping at these types of establishments and ask a lot of questions if you have any. If, however, you find yourself in the situation in which these items are absolute bargains, jump! 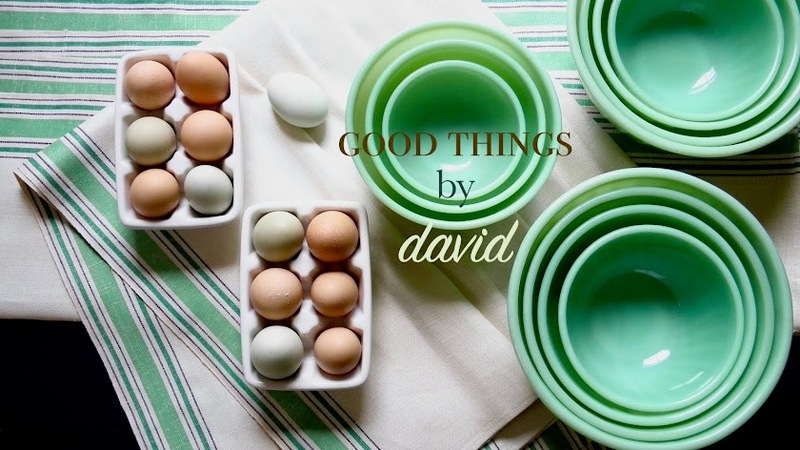 These are amazing David. That spinning wheel is a beauty. Thank you! Isn't the spinning wheel wonderful? All of the cutters are incredible! What great additions to your collection. Thanks, Kenn! 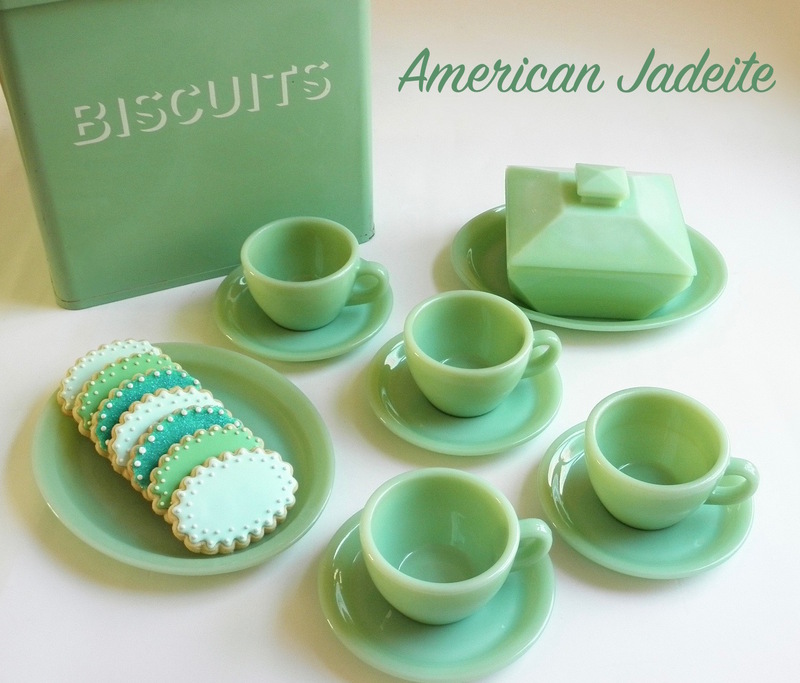 I think they're going to be great to use for cookies this year. 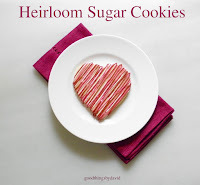 Have you made cookies with the spinning wheel? If so, how did they turn out? I have yet to use that beautiful cookie cutter!! !